Big News!, Meet Epiphanies & Peas, and Get Ready for some #WeekendCoffeeShare! My friend and mutual supporter Taylor Grace is back in fine form. Do go and give her some love. Write On, Sisters! is also back with some writing tips you want to pay attention to AND a Top Ten Tuesday involving YA lit. Check them out. They’re friends. Epiphanies & Peas, a blog I have taken an interest in, launched on Monday. You know how much I love to encourage and help other bloggers. I’ve known this blog was coming for awhile, just waited until the launch to say anything. I am eager to watch it grow and develop. Get Ready for Some #WeekendCoffeeShare! 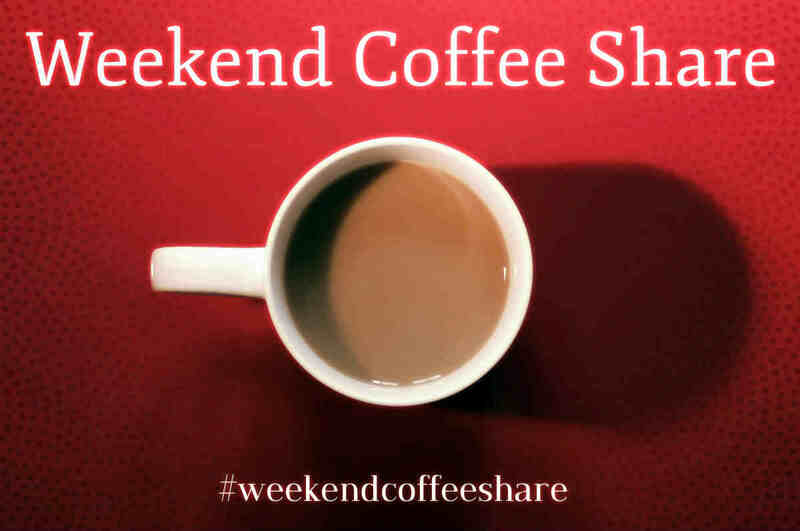 Diana has registered the hashtag #WeekendCoffeeShare to @parttimemonster and added a linky to her blog to use for weekend meetups. If you write coffee posts or enjoy reading them, you don’t want to miss this. The idea is you share your link at the Monster on Saturday or Sunday, and you can also tweet the link to #WeekendCoffeeShare so other bloggers can find it and retweet it. The first coffee share will be this Saturday, January 10. I’m not doing the full promotion yet — just giving you a heads-up until we get back on our feet and get the other projects running. But there will be a promotion before summer. A week-long one if I can swing it. A few things about why Diana dreamed this up and I encouraged it. Coffee posts can be quick and easy to write, and a ton of bloggers get on the Internet on the weekends. They can cover almost any topic, and several if you want. They can be short or they can ramble. They can be rants or just be about your week. They can be a writing excercise (and thanks to Norm 2.0 for pointing this out). You can do them or not do them at any time. You can do them on Monday, or skip them for a couple of weeks, and the next one is just as good as the last. In other words, they are the ultimate free-style feature. This is why they are the only regular feature here, and why I reference the coffee in my tagline. It’s the only feature I need to make this blog work. I’ve lost count of the number of bloggers who have told Diana and I that they started these because they read one of ours, but Nerd in The Brain certainly comes to mind, and I love her coffee mug. I wish we’d invented them or at least could remember where we saw them first, but sadly, we can’t take the credit for originality. Just for running with a marvelous idea. The second-best day we managed on any blog last year was the coffee link-up I did in August to celebrate the rollout of this blog after I moved here from my old one. That one event came very close to topping Sourcerer’s best day, which involved four posts and a lot of luck.The reason it was so big is because I announced it in advance and I invited people to drop links to their own posts, then tweeted the links and pinned a board to mark that occasion. The success of that linkup spun mine and Diana’s heads right around, and it makes us think the linky and the hashtag will totally fly. If you aren’t familiar with a linky, it is a tool that allows people to add links to a list. It looks better and is easier to navigate than a comment thread, so better for linkups. If you want to see the potential, check out how the lists work for The Broke and The Bookish’s Top Ten Tuesdays, Single Mother Ahoy’s #WeekendBlogHop, and last year’s A to Z registration page. Diana is doing a simplified one of those for Weekend Coffee posts because so many of our friends either love them, write them, or both. We chose #WeekendCoffeeShare so this can run all weekend and because we’re trying to create synergy with other social bloggers, not just replicate what others are doing. We already have #ArchiveDay for Saturdays, #SundayBlogShare for Sundays, and of course, #MondayBlogs on Mondays. I scan and retweet from all of those more weeks than not, even when I don’t have time to share links. So here is a hashtag for the whole weekend, but only for coffee posts. #weekendcoffeeshare. Now I can scan this one, too, and mix coffee posts in with my retweets, so I am not just blowing up peoples’ feeds with RTs from a single hashtag. Since it’s Diana’s project, not mine, l can be just another participant, but have a partner to work with from Day 1. I will be generous with retweets from this hashtag. If you happen to be a coffee blogger who participates in some of those other activities, we have set this up so you can work #WeekendCoffeeShare into your weekend networking with very little effort. No need to choose between the coffee share and any of those other things. Join us for the inaugural #WeekendCoffeeShare on Saturday (or Sunday, or with a coffee post you published any time during the week), at Part Time Monster. This entry was posted in Personal by Gene'O. Bookmark the permalink. Heather and I have already talked about #weekendcoffeeshare and we're in. We just don't know if it's as regular posters or only friendly retweeters yet. Yeah. I’ve been noticing the comments over there. You’re almost (but not quite) too kind 😉 Thank you very much, and best of luck. I am pleased that you are off to such a good start. Hooray! They are fun, and they are the quickest-and-easiest of the quality posts. The only written posts that take less time, on average, are the preview-type posts. Great page, informative and dynamic – I am following on twitter as well – excellent materials!